My granddog, Watson, managed a successful hunt, despite overwhelming odds. He found this plush toy beside a trashcan. After valiant pursuit, he was able to wrestle it into submission and drag its sorry carcass home. At last report, he was still standing guard over it. In the shot above, Watson has slain an unfortunate football that landed in his yard from the schoolyard across the street. 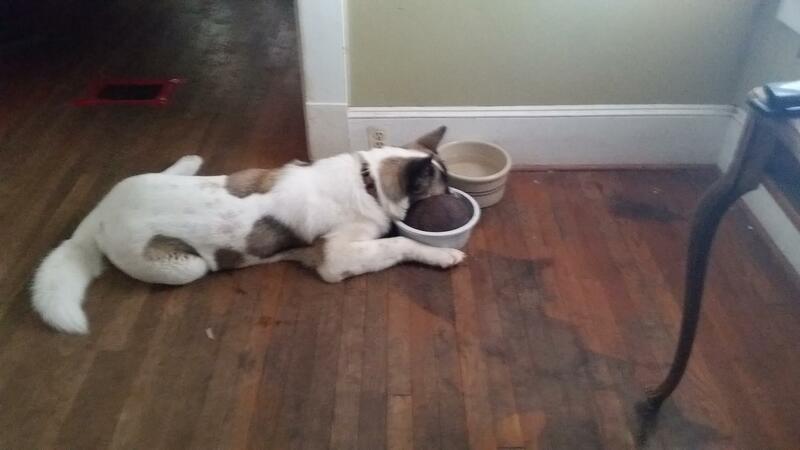 As you can clearly see, he has placed it in his food bowl in preparation for dinner. 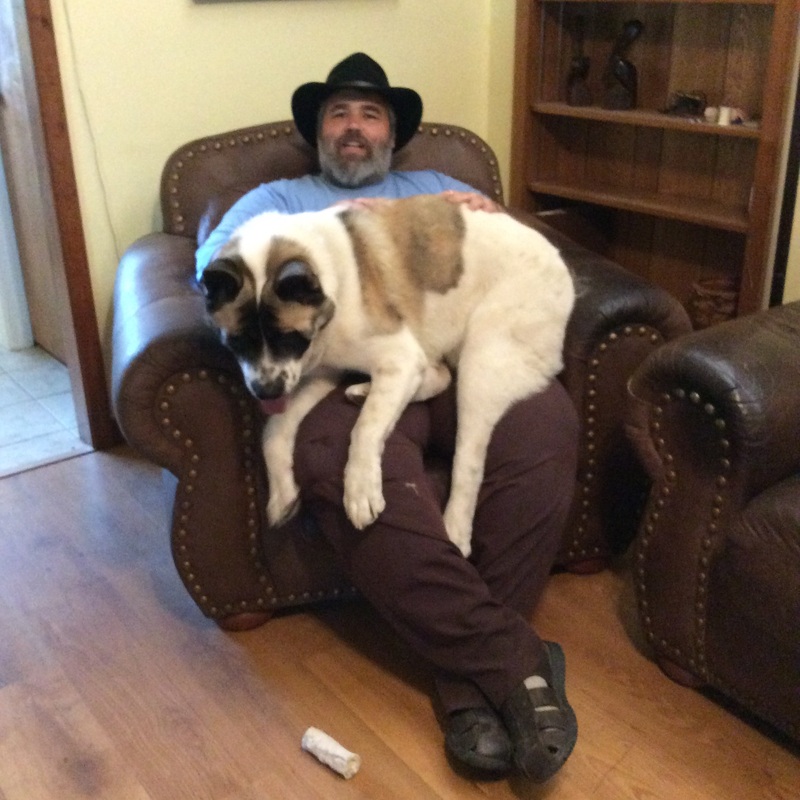 He is not a catch and release kind of dog. I am concerned that he will never be able to pass this ball even if he is successful in eating it. In the shot above, you see Watson snoozing in the bathtub. 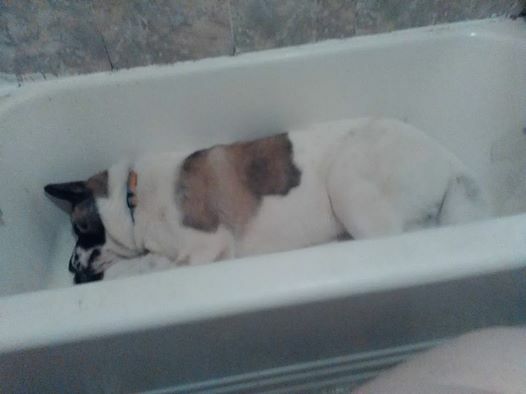 He sleeps with his snout at the drain where his snores can be amplified throughout the house. He is like a two-year-old child. He thinks he should get a bath anytime anyone else does. Should they forget to lock the door, he pushes his way in to get in the tub with them. If he gets in before they dry off, he wants to lick water droplets off. He is not a good shower friend. Dear Auntie Linda, My mother is seventy-four and moved in with me and my husband four years ago. She is in good health, still drives, and is active in her church, though she is slowing down. We enjoy having her live with us, except for the added burden when my brothers visit. She treats our home like hers. When I was growing up, Mother waited on my father and brothers hand and foot. They worked outside. Cooking and cleaning were women’s work. I was responsible for cooking, cleaning, and dishwashing right along with her. Please understand. My family is and always has been welcome. However, since Mama moved in with us, when my brothers to visit, she holds court for her guests, expecting us to lay out the welcome mat and act the gracious host on her behalf, providing huge meals, providing rooms and housekeeping services just like she always did. I am exhausted by the time company leaves. Mama won’t hear of anyone taking rooms at a hotel or bringing in a sandwich tray, or takeout, or taking us all out to dinner. By the time I have shopped, cooked and served meals for several, as well as tidying up behind them, I am exhausted, not to mention the damage to our budget. I have mentioned this to Mother, but she always reminds me , “They won’t be here but a few days. We can rest up when they’re gone. I just want my family around me as long as I am able……..” I would love it if they invited her to their homes for a few days sometime. She’s often mentioned she’d love to visit. What should I do? Worked to Death. Dear Sore Ears, My mother had a little trick that worked wonders, for us and then my kids. Have each of the children sit down with their favorite toy or book several feet apart. Instruct them not to share or play with each other. Remind them that they are not allowed to share or play together when they show interest in the other. After you reinforce this a few times, they will want to play. Relent, but tell them it’s only for a minute. They’ll have to go back to their spots at the first sign of fighting. In a few minutes, they should be anxious to play. After being apart a few minutes, playing together becomes a privilege. Often, a reminder suffices to avoid a battle. Hope it works as well for you. Being separated from a potential sparring partner can help them get along, if you stick with it. At the very least, they’ll learn to avoid fighting in front of you, which is what you really want anyway, isn’t it?